As the temperatures rise, our drinks should cool off. This spring we have three great recipes for all of our tea drinkers. These will make you never want to drink tea regularly again. Bring the water and ginger to a boil in a medium saucepan. Remove from heat and add the tea. Let stand for 10 minutes, covered. Pour the mixture through a fine strainer, collecting the ginger and tea leaves separately. Put the tea into a pitcher. Stir in the lemonade then the honey. Cool for 30 minutes then put in the refrigerator and chill for at least four minutes. Stir the mixture before serving. In a heat-proof medium glass bowl, add tea bags and honey to boiling water. Stir in honey until completely dissolved. Steep for 10 minutes covered at room temperature. Remove tea bags and let it cool to room temperature. 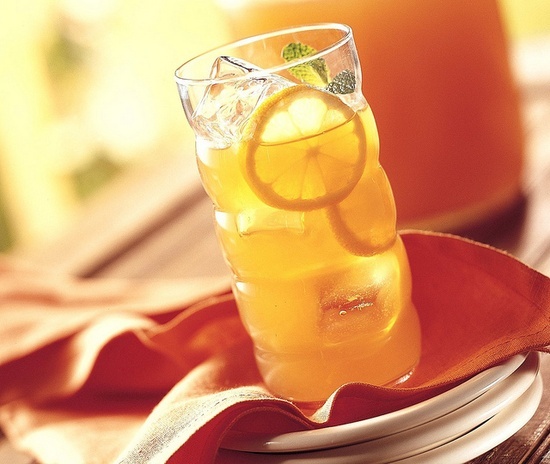 Add the orange and lemon juices to the pitcher of tea. Cover and chill for 24 hours. To serve, add the fruit and sparkling water. This should be 8-10 servings worth. Cook the tea bags in boiling water in a pan. Steep for seven minutes then toss the tea bags. Pour the tea into a pitcher. After peeling and sectioning two oranges and one lemon, add them to the tea. Stir in the orange and lemon juices and honey. Refrigerate over night. Cut one orange and lemon into slices then freeze. Discard the fruit from the tea. Add the ginger ale. Serve with frozen fruit. These three drinks are sure to make you never drink tea plain again. Enjoy!